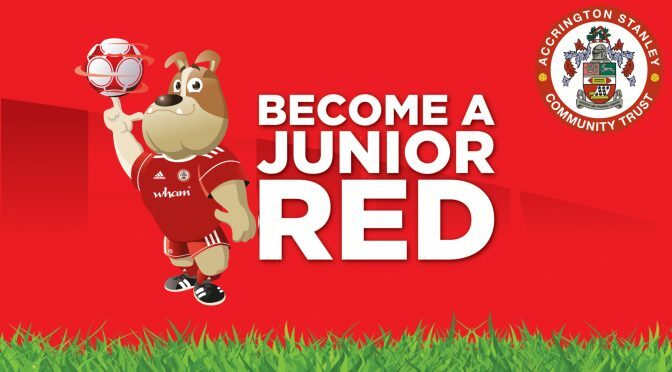 Junior Redz Memberships for the 2018/2019 season. You will receive all of the above benefits plus an U12s Season Ticket for access to all Accrington Stanley home league fixtures. If you already have an Accrington Stanley U12 Season ticket you can upgrade to the Platinum Junior Redz for just £7 extra. Please quote your season ticket reference number on the checkout page. Please note the Junior Redz is a season long membership, you must join each season in order to retain your membership. A membership starts on 1st July and ends on the 30th June each season. *All income raised from Junior Redz will go to Accrington Stanley Community Trust (Registered Charity No; 1139575) to support in delivering much needed community work in Hyndburn and the surrounding areas. Join online today by clicking here! Once you have selected the required membership package to your basket and clicked checkout you will be taken to a PayPal payment page to complete your membership. If you do not have a PayPal account you can pay with any credit or debit card.